New Mate20 and Mate20 Pro devices look to target “young entrepreneurs” with souped-up AI power. Huawei has unveiled its most powerful smartphone to date with the launch of the Mate20 and Mate20 Pro devices. Launched at an event in London today, the two new offerings feature Huawei’s latest advances in mobile AI, as well as significant upgrades when it comes to hardware and security. Huawei says that the new devices are designed for “new entrepreneurs”, offering a device that is ideally suited to all-day working or entertainment purposes, as well as all-day battery life. 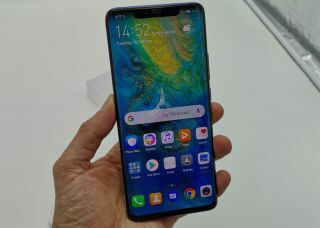 The Huawei Mate20 Pro is the more powerful of the two new launches, featuring a 6.39in display which has fingerprint scanning embedded in the screen for the first time. Inside, there is Huawei’s newest Kirin 980 chipset, which the company says is the world’s first 7nm AI chipset, as well as the first Cortex A-76 based CPU. Inside this is a dual-NPU set-up to boost AI performance, with one unit taking care of “logical” AI experiences such as image recognition, with the partner hardware handling more complex tasks such as natural language processing and video streaming. Also included is 6GB memory and 128GB internal storage, with an eye-catching new camera set-up that arranges its lenses (including a brand-new ultra-wide angle sensor) in a square. Power is supplied via a huge 4,200mAh battery that Huawei says can happily supply two days worth of juice. When you do run low, the upgraded SuperCharge service is able to provide 70 percent battery life from just 30 minutes of charging. For the first time, the Huawei Mate20 Pro features wireless charging capabilities, which the company says is 160 percent faster than that seen in the iPhone X - and you can even utilise your own device as a wireless charger for family and friends if you’re feeling generous. As for the Huawei Mate 20, it comes with a slightly smaller 4000mAh battery, 4GB RAM and 128GB storage.